Mesothelioma progresses through four stages. Early stages offer a more hopeful prognosis while a later stage diagnosis often means the patient is limited to palliative care. There are four stages of mesothelioma defined by certain disease characteristics. Early stage patients have more treatment options and a better prognosis. Advanced, late stage mesothelioma can often only be treated palliatively. Pleural mesothelioma is the only type with an approved staging system. Mesothelioma can be categorized into one of four stages, which classify how far the cancer has progressed in the body. Mesothelioma staging is part of the diagnostic process and a critical component of developing a patient’s treatment plan. Because of the long latency period and general symptoms, most mesothelioma patients aren’t diagnosed until stage 3 or stage 4. In general, at more advanced stages, patients have less curative treatment options and a worsening life expectancy. By stage 4, patients will likely only have palliative treatment options available to lessen symptoms and improve quality of life. Malignant pleural mesothelioma, the most common type of mesothelioma, is the only type of mesothelioma that has an approved staging system at this time. Many staging systems have been developed and used over the last several decades for pleural mesothelioma. Each staging system possesses specific criteria for the different stages. Across all the staging systems, however, it’s apparent that as the stage becomes higher in number, the disease is generally more advanced, more difficult to treat, and carries a worse life expectancy. The most common staging system for pleural mesothelioma is known as the American Joint Committee on Cancer (AJCC) TNM staging system. It may also be referred to as the International Mesothelioma Interest Group (IMIG) staging system. Both the AJCC and IMIG have approved the staging system for universal use and the system is updated most frequently. The TNM acronym represents the following: Tumor, Node and Metastasis. Following each letter in the TNM acronym, a number is assigned to designate the extent of disease in that particular category. The information identified by TNM is then collectively used to assign a corresponding stage. For example, a person with T1N0M0 disease represents a tumor that is confined to the site of origin (T1) and is without nodal (N0) or metastasis (M0). The TNM information in this example corresponds to a stage 1 diagnosis. Refers to disease which is confined to the primary site, or site of origin. The lymph nodes are free of disease and there are no metastases present. Most often, treatment for stage I mesothelioma consists of surgical resection, or removal, of the disease. This stage may be further subdivided into IA and IB depth of pleural tumor involvement. Refers to disease which is confined to one site. While the lymph nodes are still free of disease and there are no metastases present, the tumor extends into the deeper pleural surfaces on the same side as the tumor as well as at least one of the following: the diaphragm or the lung. Refers to disease which either has spread to lymph nodes on the same side as the tumor; or, a tumor which is extensive and involves the deeper pleural surfaces as well as at least one of the following: chest wall, thoracic fascia, sac around the heart, or mediastinal fat. The tumor is still considered resectable by surgery. There is no metastasis present. This stage may be further subdivided into IIIA and IIIB depending on contralateral mediastinal lymph node involvement and deeper chest wall invasion, respectively. Refers to disease in which one of the following occurs: the tumor is too extensive for surgery, there is distant lymph node involvement on the opposite side from the tumor, or there is distant metastasis present. The Brigham staging system is another older staging system for pleural mesothelioma. It is primarily focused on whether or not a tumor is able to be surgically removed (stages 1 and 2). The system also notes if the cancer has spread to the lymph nodes, which generally indicates a later stage that likely is not viable for surgery. Patients who undergo surgical resection have a better prognosis than patients who do not undergo surgical resection. At this point, mesothelioma is resectable and there is no lymph node involvement. Mesothelioma is still respectable during stage II, but the lymph nodes are now involved. This stage involves the presence of unresectable mesothelioma extending into the chest wall, heart, or through the diaphragm or peritoneum; with or without extra-thoracic lymph node involvement. This stage indicates distant metastatic disease (widespread cancer throughout the body). The Butchart staging system is the oldest staging system. It is based mostly on extent of the primary tumor. This system is limited in that researchers developed it from a small sample of patients. Additionally, it was developed prior to the use of modern imaging methods, such as CT scans. Mesothelioma is present in the right or left pleura (the thin, transparent membrane which covers the lungs and lines the inside of the chest walls) and may also involve the diaphragm (the muscle separating the chest from the abdomen) on the same side. Mesothelioma has invaded the chest wall or involves the esophagus (food passage connecting the throat to the stomach, heart, or pleura on both sides. Lymph nodes in the chest may also be involved once the cancer reaches Stage II. Mesothelioma has penetrated through the diaphragm into the lining of the abdominal cavity or peritoneum. Lymph nodes beyond those in the chest may also be affected. There is evidence of metastasis (the spreading of the mesothelioma) through the bloodstream to other organs. Unlike pleural mesothelioma, peritoneal, pericardial, and testicular mesotheliomas do not currently have a universally accepted staging system. This is because there are not enough cases each year to develop and validate a formal staging system. Without a large sample of patients, it becomes increasingly difficult to develop and validate both staging systems and treatment options. In the absence of a formal staging system, peritoneal mesothelioma is most often characterized by more general mesothelioma stage characteristics, as seen above. Doctors sometimes rely on the Peritoneal Cancer Index (PCI), which grades tumor size and location by distinct regions in the abdomen. Added together, the PCI score can help determine how advanced the mesothelioma has become and if a patient is eligible for surgery. If the mesothelioma tumors are confined to the abdomen, surgical removal is often attempted with the possibility of delivering heated chemotherapy directly into the abdomen during the surgery in a procedure called HIPEC (hyperthermic intraperitoneal chemotherapy). If the disease is not confined to the abdomen, chemotherapy or radiation therapy to specific sites of metastases may be administered. Prognosis for peritoneal mesothelioma is generally poor. Patients who are able to undergo surgical removal and HIPEC have a better prognosis, with more than 50% of patients surviving 5 years or more. Pericardial mesothelioma is rarer than even peritoneal mesothelioma, and therefore has very limited information available regarding staging, as well as very limited treatment options. Pericardial mesothelioma stages are typically determined by more general cancer staging characteristics. The size of the tumor on the pericardium, or sac surrounding the heart, often determines the treatment available. Surgery involving the pericardium carries significant risk. Smaller tumors may be appropriate for surgical removal, whereas larger tumors often cannot be safely removed. With so few cases, researchers are unclear of the best treatment options outside of surgery. As such, prognosis for pericardial mesothelioma is universally poor, with many patients surviving between six and ten months from diagnosis. Testicular mesothelioma is the most rare form of mesothelioma, accounting for only about 1% of all cases. Because of its rarity, doctors typically determine staging by whether the mesothelioma cells are localized to one site of the testis or have spread outside of the area of the primary disease site. Surgical removal of tumors that are confined to the abdomen or are limited to nearby lymph nodes provides the best opportunity for survival. Prognosis for testicular mesothelioma is around two years. 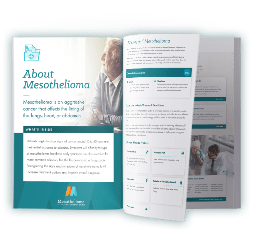 A patient’s stage of mesothelioma is one of the most important factors in determining a treatment plan, along with the type and cell type and the patient’s overall health. Patients diagnosed at an earlier stage may be recommended to undergo surgery followed by chemotherapy and/or radiation therapy to improve prognosis. At later stages, chemotherapy alone or with radiation therapy is the standard of care, and may be applied palliatively. Emerging treatments, including immunotherapy and photodynamic therapy, have shown promise even for patients with more advanced disease. In recent years, more mesothelioma clinical trials have seen success in extending life expectancy with new treatment combinations, as well as further tweaking standard treatment methods. Even in the face of such a grim diagnosis, there is hope and some mesothelioma patients have survived months and years beyond even their best case prognosis. 1 American Cancer Society. Malignant Mesothelioma Stages. December 2017.